The language, imagery, and portrayal of characters in this novel was so moving and vivid. By the time it was finished, I felt like everyone should know the history behind it. You know when you read a book and something stupid, or something that doesn't quite make sense happens? And it kicks you right out of the book? Instead of being in the story, you're back in your bedroom thinking, "What the... WHY??" McKeon kicked me out of his debut novel SO many times... but for completely different reasons. There would be passages so beautiful— taking something ordinary and making it magical—that I couldn't go on until I had read them over again just to marvel at them and contemplate their meaning. Or I'd just stop and imagine what it would feel like to have such a thing happen to me or my loved ones. A.R. Braithwaite and I have recently discussed how poor the English language is compared to some of the other languages that we speak. But when I read Darragh McKeon's manipulation and command of it in this work, it reminded me that in the right hands, English can be magnificent. If you're going to read one book this year based on beautiful writing, choose this one. 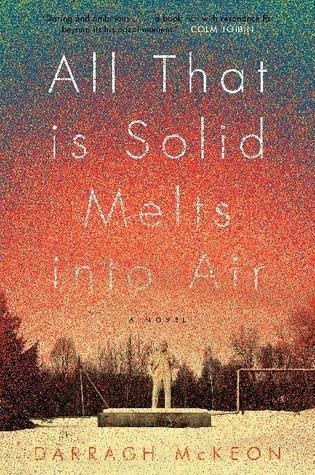 All That is Solid Melts into Air is an account of the aftermath of the 1986 Chernobyl disaster. This is mixed in with the general nature of living in the Soviet during the time before the fall of the Iron Curtain. Taking a peek into this piece of history was humbling. I felt like the oppression and fear, the unfairness... it felt like something from "the olden days". But in truth, I had already been born during the events of this book, (okay, so I was two or three years old—and no jokes about me being old either!) and knowing that was a real eye opener to how incredibly lucky we are in the United States. How we have the option of criticizing the government without our families and friends fearing for the fall back. All That is Solid Melts into Air shows what kind of devastation happened when the Soviet government withheld important information from the public. It showed with vivid imagery, how the disaster of Chernobyl would haunt family lines for generations. This story follows three families and several points of view. It's built on the flashbacks of each character, with the Chernobyl disaster being only a means to make the story move forward. The flashbacks can be a bit confusing. They go backwards in a way that gives you a bunch of information you're not sure what to do with. As you continue reading, you'll gain more information to add to what you first learned, until at last, at last you gain a full understanding. OR before a flashback hits, you'll learn point blank what the outcome of a situation is, and the flashbacks will slowly fill you in on how the outcome came to be. I admit that this felt spolierish some times, and confusing other times, but ultimately, I'm not complaining. I liked it. Because of the way the flashbacks worked, there were a few main characters that I felt like I didn't know at all until the end of the book. But when I closed the book, I knew everything about them. It was an interesting way to develop the characters. Despite this, it is to McKeon's credit that you can feel so much about characters you hardly knew. Especially the secondary characters that you never meet deeply. This story isn't so much the kind with a basic goal and set journey (read: plot line), but more of a glimpse into a piece of history. I did at several points ask myself where the story was going. What was the point? On a basic level, some take aways are about being kind, that things are not always as they seems, real love, and being true to yourself. On a bigger level, I did some research on the title of the book. It's part of a quote by Karl Marx in the Communist Manifesto. I found one online explanation of the quote that made absolute sense after having read the book and felt like the story was a literary work describing it's namesakes theory. "All that is solid melts into air" refers to a passage in the Communist Manifesto by Marx and Engels. These are visionary words, as communism itself has evaporated and capitalism has also lost its way. They referred first of all to the fact that capitalism by its nature is constantly expanding and therefore needs to constantly revolutionize itself in order to create new markets, leaving nothing solid or permanent in its wake, both destroying and conjuring into existence everything from cities to human populations along the way. They were also speaking of the way that capitalism reduces everything to the shadowy abstraction known as money. Both of these processes have accelerated and transformed themselves in the twentieth century. New technologies have greatly expanded the human capacity for both creation and destruction, and the universality of money as a standard of value above all others has been supplemented by the (much discussed) process through which everything, if it is to be felt to exist at all. Marx's prophecy is as prescient as ever. In short, a whole host of phenomena, ranging from the weakening and porosity of national territorial boundaries, the actual and potential "globalization of contingency" in the form of global pandemics and the specter of environmental catastrophe, to the backlash of increasing territorialization as new forms of imperialism, international isolationism, political fundamentalism, ethnonationalist particularism, or projects for a "fortress Europe"--seek to reverse these trends, point to the increasing salience of changing conceptions of space and time in our contemporary globalizing world. I chose bottled water as the drink for this book. First, because something bottled and shipped in is clean and clear of contaminates. Second, because water is straight forward, simple, clear and thirst quenching.